To become a patient of AGC, all you have to do is walk through the front doors! Several office workers will greet you when the doors open, and from then on, getting registered and ready to meet with a health care provider is easy. Just follow a few easy steps. 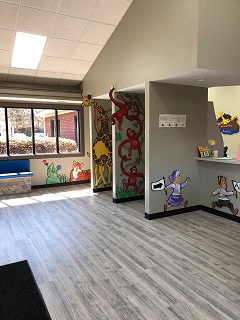 This is the first thing you will see walking into our clinics. Please do not be afraid to step up and begin speaking to our office staff right away. We will review your demographic information and take co-payment, then get you situated to see your provider. In the front you can also request prescriptions, records, and statements, as well as make payments on your account. If you wish to speed up your check-in process, please fill out registration forms prior to coming in for your first time. To the right are the documents you will need. Our on-line patient portal is now available from home. Register even before your first appointment. Note: You only have to read the notice of privacy practices and sign stating that you have done so. Additional documents that you may need for your child's appointment are available here.